Smartphones have made digital photography all the more accessible for the average Joe. Photo editing tools and organizers are no longer just niche products for the serious photographer. Even though it seems that anyone can do it because of how easy technology makes it, photography is still a very important art-form. It allows us to capture and store moments that are meaningful to us. Because of life’s very transient nature, it’s important to have some ephemera to look back on and remind us that we once lived. Photographs express what is important to us, and they allow us to communicate through a visual medium without the use of words as well as leave a legacy and record history. As a result, it’s also important to make sure that those memories are saved and organized so you know where to find them when you need them. This list should help you find the best photo organizing software that is suited for your archiving, browsing and management needs. The follow photo organizing tools do their jobs well, but you should be careful when using them to organize your image files. In case you accidentally deleted important photo or video files, don’t hesitate to use a free photo recovery software to get them back. When it comes to building superior multimedia and niche creativity software, Adobe has always been hard to contend with. That same standard of quality permeates through Adobe Bridge and that’s why it is the number one entry on this list. Although it mandatorily comes as part of Adobe Creative Suite, users can download a standalone package for free. Bridge CC allows you to access all your images and files from a single location. You can label and rate the photos. This gives you more sorting options. In addition to this, Bridge CC comes with automated cache management. Users can decide if they want to store the cache in a central location or in different individual folders. It comes with support for Retina and HIDPI displays and it allows users to upscale (or downscale). Bridge CC is way more than a photo management tool. If you’re looking for something to help you organize, make simple edits and potentially help you publish and share your work, Bridge CC comes highly recommended. What makes digiKam great besides its ability to help professional photographers transfer and organize their work, digiKam is also open source. There are versions for Windows, Mac and Linux. The application permits users to transfer videos and pictures directly from their smartphones, digital cameras and external storage devices. It gives users the ability to then automate this process by configuring the import settings and rules, which ultimately allows for on the fly sorting and organization. It comes with a powerful search tool embedded in an otherwise user-friendly user interface. It supports nearly every image and video type including raw files. The application also allows users to edit their image files. 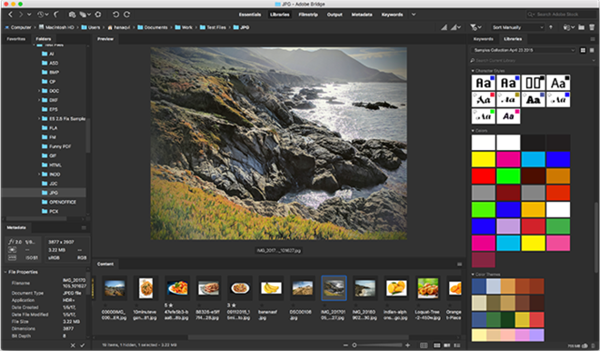 It provides users with a set of tools for editing images including (but is not limited to) cropping, colour correction, sharpening, panorama stitching and curves adjustment. 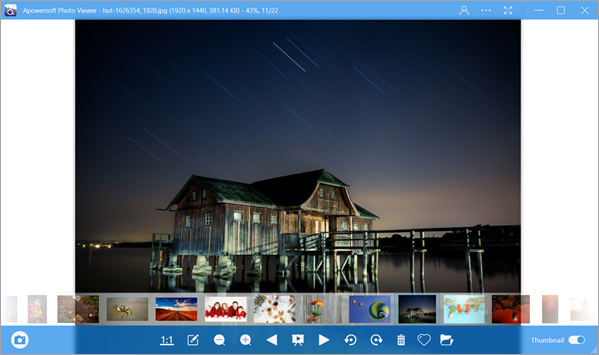 Because of digiKam’s portability and sheer quality despite it being free and open source, we think it is worth downloading. We rank it second only because the photo organizing app tends to take up a lot of running memory, which could cause high CPU usage issue. Nikon is known globally for its imaging products. They produced Nikon ViewNX-I to help users transfer images from their digital cameras to their computers. But the functionality isn’t limited to this. Non-Nikon users can benefit from using it for its other capabilities. First and foremost, besides it being an import tool, it allows users to browse and sort through their files. It can read embedded location data to pinpoint and map where photos were taken. VieNX-i also supports use with social networking sites and other web services. It comes packaged with a movie editor that makes processing and editing your videos a lot easier. 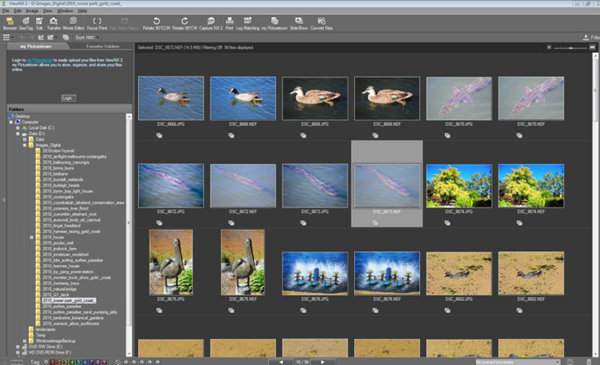 The application also interfaces and works with Capture NX-D which can be used to convert and save raw images as other file types. XnView is one of the oldest photo viewers and organizers. It was released back in 1998 and it’s one of the most used computer applications for photo viewing and file management ever. XnView in its current iteration has seen a lot of attention and critical acclaim. But still, no product is perfect and everything can be improved upon. That’s why in 2018 XnView’s creators saw fit to release XnViewMP which is an enhanced version of the original and its planned successor. XnViewMP comes with everything that the original does which includes a hex inspector and a facility to batch rename and edit your files. It also comes with a screenshot tool to make creating screen grabs all the easier. Not only can you organize your images, but also resize, crop, rotate, adjust the colours, apply filters and edit them in many other ways. XnView supports over 500 image file formats as well as audio and video. You can also use it to convert and write over 70 different file types. It also has a useful tool for finding duplicate images. 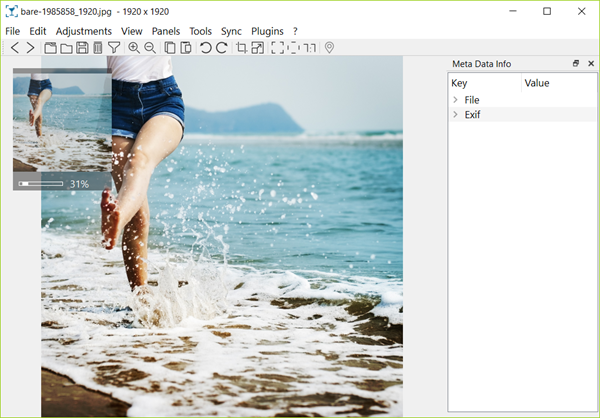 If you’re looking for an image browser with a long-trusted lineage and an additional array of functionality, look no further than XnViewMP. It’s free for personal use and it has versions for Windows, Linux and Mac. It also has multilingual for non-English users. Nomacs is another free open source entry on our list. One of the things that makes Nomacs unique is its ability to browse through images in a zip file or Microsoft Office document. Nomacs is light-weight and user-friendly. It has semi-transparent widgets that show added information such as metadata. It has an expandable file explorer panel for easier image browsing. The user interface is well organized and its main focus is on the images shown through the application. It allows you to implement simple filters and searches so you can easily find and organize your files. You can choose to enable or disable the cache. Activating the cache means that the application will be able to switch between large images faster. Nomacs allows you to perform simple image editing functions, such as adjusting the hue, colour and contrast. You can use the pseudo colour function to create false colour images. You also run different instances and synchronize between these instances. This can be useful for image comparison. It’s a multiplatform application. There are versions available for Windows, Linux and Mac. In addition to this, it’s completely free for personal and commercial use. However, Nomacs is actually not very friendly to beginners since the interface is quite simple and not straightforward. 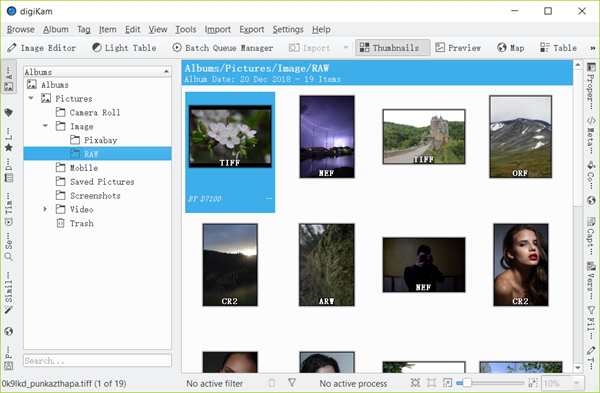 Apowersoft Photo Viewer prides itself on its low resource consumption which means it’s faster and smoother than most image organizers on this list. You can easily scroll through large pictures instead of zooming in and out of them. 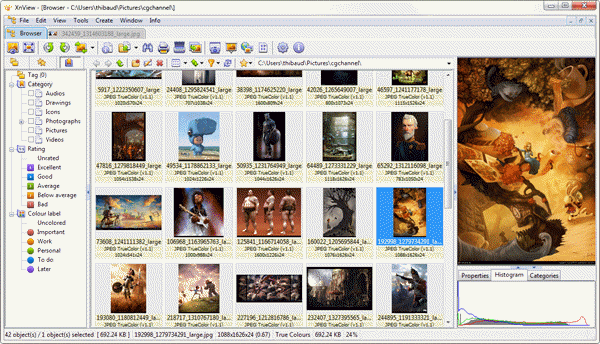 The application provides users with the facility to edit and process images in batch. It also comes with a quick screenshot tool that allows you to quickly edit and save your screen grabs on the fly. Apowersoft Photo Viewer also grants users the ability to view PDF files without downloading any other PDF viewer. It supports the conversion of raw data into common image file formats like JPG, PNG and TIFF. 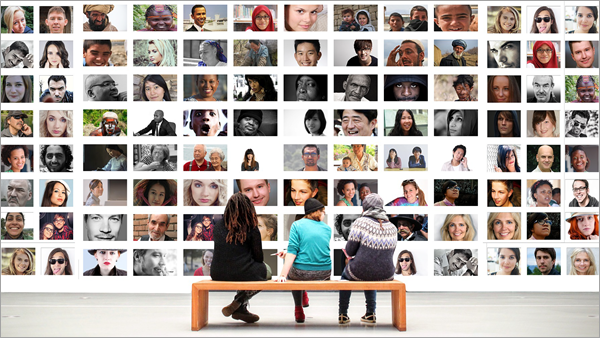 Just like many other organizers on this list, this application allows you to interface with social media websites like Facebook so that you can share your images with one click. Apowersoft is a great application with a minimalistic but comprehensive design. It focuses on displaying pictures but it offers a lot more. It’s definitely worthy of your download. Since a picture speaks 1000 words, we know that there are users out there who have folders packed with essays and tomes in the form of images. We hope that this list has directed you to the right application that will help you get them organized. If you have any other recommendations of your own, please do not hesitate to put them in the comment section below.